Dollar General is expected to make a decision in the coming weeks on whether it will build a new store on Franklin Avenue. ALIQUIPPA — Dollar General is expected to make a decision in the coming weeks on whether it will build a new store on Franklin Avenue. The Tennessee-based franchise has been exploring the possibility of locating in Aliquippa for more than a year. Last April, company spokeswoman Angela Petkovic said Dollar General officials were doing their “due diligence” in researching whether to locate there. Petkovic reaffirmed Tuesday that a decision is expected soon. Aliquippa Mayor Dwan Walker previously said that Dollar General was interested in a piece of property right next to the municipal building on Franklin Avenue. That property currently serves as a parking lot. If the store is built there, Petkovic said, the Franklin Avenue store would employ six to 10 people. She added that convenience for shoppers is a major factor when considering where to build a store. “We also take demographic trends, competitive factors, traffic patterns and community concerns into consideration,” she said. Nearly a dozen Dollar General stores currently operate across Beaver County, including locations close to Aliquippa: Hopewell Township, Center Township and Ambridge. Just more than 9,000 people live in Aliquippa. It was once the economic heart of Beaver County, but the collapse of steel in the late 1980s and early 1990s decimated the city. Some people say Aliquippa’s been dying a slow death ever since, but its leaders disagree. Mayor Dwan Walker was sitting next to that mural when he got the call about a $3.3 million grant from Pennsylvania’s Neighborhood Partnership Program. It was a few days before Christmas, late in the morning, when the number of the regional director of the Department of Community and Economic Development’s popped up on his cell phone. A mural adorns a wall inside the city administration in Aliquippa. Walker looked at the number and was certain it was bad news. He picked up anyway. “We didn’t get the grant, did we?” he said. But the woman on the other line had different news. He said he couldn’t quite believe it; he made her promise she wasn’t joking. “‘Dwan, Mayor Walker. Everybody up here’s talking about it. You got it,'” he recalled her saying. That phone call was the culmination of nearly two years of work spent positioning the city to compete for the money. Being the mayor of Aliquippa pays $175 per month, so all the meetings and phone calls and planning happened on top of Walker’s full-time job at Guardian Protection Services. Getting the phone call was a huge moment, he said. Walker immediately jumped off the phone so he could call his brother, Councilman Donald Walker, who also chairs the Aliquippa Economic Development Corporation. Donald couldn’t believe it either. “’Are you serious? Bro, are you serious? '” Dwan remembered his brother asking. “And then I said, ‘hell yes.’ Thank God,” said Donald. The first priority is tackling blight. On a chilly but sunny Thursday afternoon, Mayor Walker put his hazards on in order to crawl down Franklin Avenue in the heart of the city. He pointed out buildings they have to tear down: a collapsed building where mill workers use to pick up their paychecks, an old hotel, a boarded up building that used to house a catering company and a couple other businesses. They’re not demolition happy, though. After 20 years of neglect, a lot of buildings are falling down. By clearing them they hope to attract new housing developers and businesses. Turning toward the Ohio River, Mayor Walker drove through a tunnel to the 7-mile stretch of riverbank where the J&L steel mill used to be. He pulled off the road into a field and both brothers got out of the car, remembering what used to be in the empty space. At its peak, the mill employed close to 17,000 people. When it closed, it leveled lives. Today, nearly 30 percent of Aliquippa’s residents live below the poverty line. The mill buildings and the jobs they provided are long gone. And while standing in that vast, empty space puts Aliquippa’s current circumstances in context, both Walkers say they’re tired of talking about the storied past. The state grant is a start. 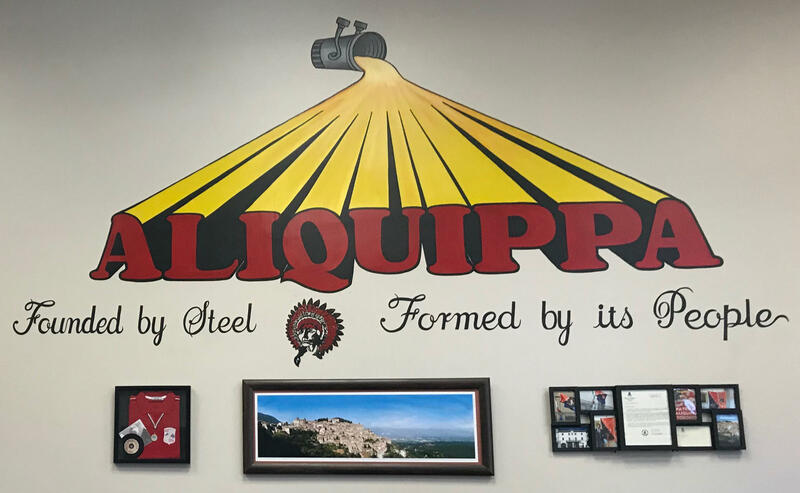 It will allow Aliquippa and its partners to spruce up the streets, but also to invest in residents, helping them to prepare for new jobs and future opportunities. That investment is crucial because the Walkers, Beaver County and the state of Pennsylvania soon expect to see other kinds of investment at the former mill site and in the region. Shell Chemical Appalachia is building its ethane cracker plant just miles away in Potter Township, said Dennis Davin, secretary of the Department of Community and Economic Development. “The fact that Aliquippa is a city in close proximity to that, we think that presents some opportunities,” he said. Shell’s impact is expected to be so big the county doesn’t fully have its arms around it yet, said Jim Palmer of the Beaver County Corporation for Economic Development. But he said Aliquippa’s leadership seems poised to capitalize on whatever benefits the plant may provide. It’s the Walkers’ all-hands-on-deck-slogan in action. Aliquippa will create a digital media lab in its library, as well as bring a nonprofit job training program downtown so it’s accessible to people with few transit options. The city is also partnering with the Salvation Army to provide emergency food assistance to the community’s most vulnerable residents. Thousands of people left Aliquippa when the steel industry collapsed, and the people who stayed deserve to see the benefit of new opportunities, said Councilman Donald Walker. Aliquippa will never be what it was, they say. But the Walkers are hoping to help people imagine something new. It is now $50.00 per quarter if you are over the age of 65 (with proof of ID). Everyone under 65 years of age, it is now $55.00 per quarter. You will still be eligible for a yearly 10% discount if paid in full for the year, (Senior discounted rate is $180.00 for the year. Regular discounted rate is $198.00 yearly) The Water Authority will be sending further instructions with the bill as to when the discounted rate is due.